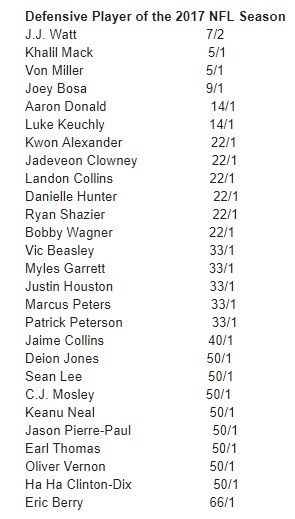 If you’re placing an opening bet on the NFL’s Defensive Player of the Year, the odds for Jadaveon Clowney and Danielle Hunter are the same, at least at Bovada Sportsbook. MANKATO — If you’re placing an opening bet on the NFL’s Defensive Player of the Year, the odds for Jadaveon Clowney and Danielle Hunter are the same, at least at Bovada Sportsbook. 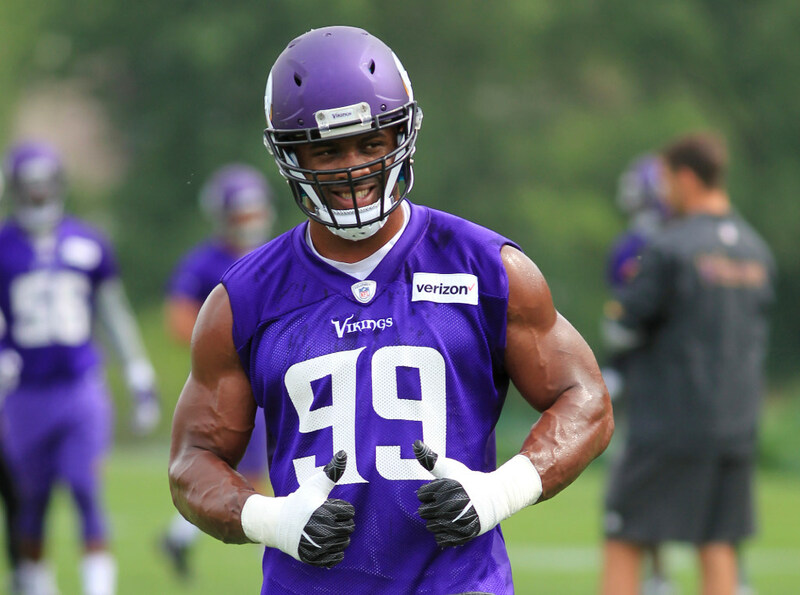 With odds of 22-1, Hunter, the Vikings third-year defensive end, trails only J.J. Watt, Khalil Mack (5-1), Von Miller (5-1), Joey Bosa (9-1), Aaron Donald (14-1) and Luke Kuechly (14-1). Watt is the favorite at 7-2. Hunter is the relatively unheralded name, at least nationally, near the top of the list. At 22-1, you’ll get the same returns on Hunter as if you placed a bet on Clowney, Kwon Alexander, Landon Collins, Ryan Shazier and Bobby Wagner to win DPOY this season. That’s what 12.5 sacks as a part-time player can do. Hunter’s sophomore surge has lifted him this summer into the starting lineup and onto the radars of anybody paying attention. Yet he’s the only defender receiving those odds, other than Bosa, with fewer than 1,000 career defensive snaps under his belt. He also has just one career start, which will change this season as he’s lined up opposite Everson Griffen throughout training camp. That’s where the expectations start when anticipating what Hunter could do with a full-time role. The Vikings haven’t had a Defensive Player of the Year winner since 1989. Last year, Hunter topped one record set by the NFL’s first DPOY, Vikings legend Alan Page in 1971, by becoming the youngest player in franchise history to lead the team in sacks.